Gmail now accepts addresses with accented or non-Latin characters, but no emojis. Where Are the Emoji Email Addresses? An emoji email address would be the ultimate form of self-expression. On Tuesday, Gmail announced that it will now support email addresses that have accented or non-Latin characters. As a Google blog post points out, this will be potentially useful to that the billions of people whose native languages don’t use Latin characters—half of the world’s population. In 2012 the Internet Engineering Task Force made a new standard that would allow for these diverse characters in email addresses. But there’s no point being able to make an address that email providers won’t actually accept mail from. So Google is trying to be a role model for other big email clients by adopting the standard. That’s cool, but let’s get to the important question: Does this mean we can all have emoji email addresses?! The Slate staff is all over it. One editor immediately called dibs on “earofriceearofriceearofrice@gmail.com.” (Ear of rice is a real emoji. Who knew?) Another said, “I want the little skull and the coiled snake!” Using carefully selected pictograms to represent yourself instead of words like your name (boring) would just be more fun. 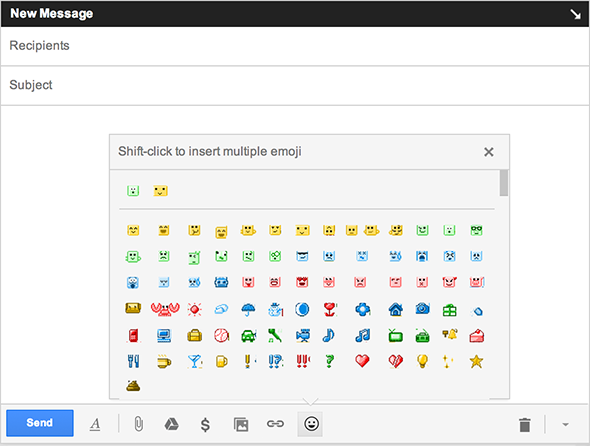 And Gmail has a great emoji library. Come on, Google, you gotta give the people what they want, right? Unfortunately not. :( A Google spokesperson explained in an email that, “Gmail users can now send emails to, and receive emails from, people who have non-Latin characters in their email addresses, but one cannot create Gmail addresses with non-Latin characters (or emojis) in them.” It’s a bummer for sure, but maybe Google will see the light in the future. The company’s blog post announcing the change is called “A first step toward more global email.” The second step should clearly be emoji addresses.